Jim Gordon continues to uphold the law while the audience waits for a caped crusader. Has the Gotham TV show been cancelled or renewed for a fourth season on FOX? The television vulture is watching for the latest cancellation and renewal news and this page has been created to give our readers a dedicated place to track the status of season four of Gotham. You can bookmark this page or subscribe for the latest updates. Remember, the television vulture is watching your shows. Are you? 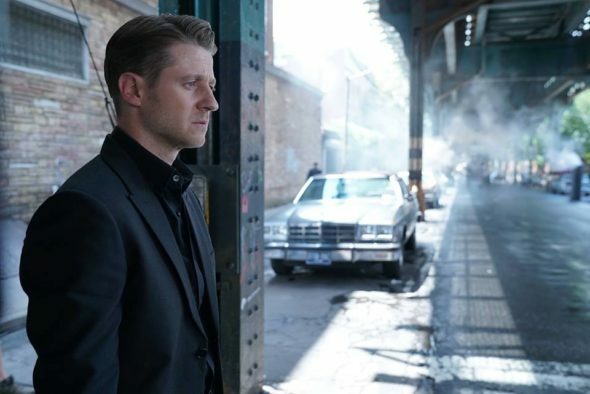 Airing on the FOX television network, Gotham tells the early stories of police detective James Gordon (Ben McKenzie) and iconic Gotham City characters — before they became legendary crimefighters, villains, and heroes. Season three begins with Gordon taking matters into his own hands and becoming a vigilante. The rest of the cast includes Donal Logue, Morena Baccarin, Sean Pertwee, Robin Lord Taylor, Erin Richards, David Mazouz, Camren Bicondova, Cory Michael Smith, Jessica Lucas, Chris Chalk, Drew Powell, and Michael Chiklis. The third season of Gotham averaged a 1.08 rating in the 18-49 demographic with 3.33 million viewers. Compared to season two, that’s down by 23% in the demo and down by 19% in total viewers. Find out how Gotham stacks up against the other FOX TV shows. On May 10, 2017, Gotham was renewed for a fourth season. It debuted on Thursday, September 21, 2017. Follow it here. The ratings have been coming down once again this year and Gotham isn’t the hit series that FOX would like it to be. However, the network has lots of ratings challenges these days. On top of that, a fourth season of Gotham will give the studio enough episodes for a good-sized syndication package. For those reasons, I am confident that Gotham will be renewed for a fourth season. 5/10/17 update: FOX has renewed Gotham for a fourth season. Details here. Check the rankings for all of FOX’s 2016-17 TV shows. Read other Gotham TV series news or other FOX TV show news. Check out FOX status page and other TV show status pages. What do you think? Are you glad that the Gotham TV show has been renewed for a fourth season? Would you have been upset if this FOX TV show had been cancelled instead? I LOVE Gotham. It is one of the best episodic tv shows around. Please don’t cancel it. Please, please, please………PLEASE!!!!!!!!!!!!! My wife and I look forward to Gotham each and every week. It is one of our guilty pleasures and one of our favorite shows on TV. Please renew!! Please dont take gotham off its our favorite show. Keep the show on the air. Love Ben McKenzie!!! watching the characters before they morf into their batman role is amazing I would love if it continued until bruce Wayne officially becomes batman etc with all the characters. Please continue with the series Gotham. It’s quirky but real entertaining.